Masereel invented the idiom of the pictorial novel, narrative books consisting of images with no texts. 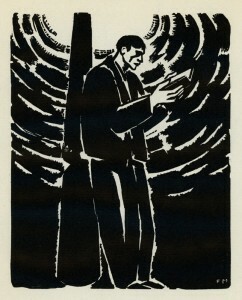 Masereel, who contributed large numbers woodcuts to radical journals, here chronicles one man’s life, through youth, first love, political awakening, action, and death. His direct and easily-read images became synonymous with socialist iconography and were, with the prints of Käthe Kollwitz, a primary source for the burgeoning woodcut print movement in revolutionary China.